Pure white powder is covering everything again outside. It's so still, clean and peaceful. It's 11 o'clock in the evening and the kids, my husband and I are all watching the snow fall excitedly. Finally. The kids had been waiting for the ground to turn white all afternoon but the snowflakes had been melting as soon as they fell on the ground. There was no white carpet to play on this afternoon. When I wish for more snow, I feel so guilty. All over the country, snow had been falling ceaselessly that it had and still is causing serious problems. Fresh food is not as available as it should be. I was in a big supermarket the other day to stock up on supplies for this coming weekend, when I looked at amazement at the rows of half-empty and completely empty baskets of fruits and vegetables. Whatever was left was not so fresh-looking anymore but I didn't have a choice, just like the other shoppers. We all grabbed what we needed. And I hurriedly hoarded different kinds of tomatoes. I cannot run out of them. My kitchen feels empty without a single one of them around. Tomatoes are staple in my kitchen and I always make sure that I have them in the fridge. But there are times when I run out of them while in the middle of cooking like what happened to me the other day. I know, why didn't I check ahead before cooking? I already chided myself and believe me, I promised myself that it won't happen again. It's a good thing there are neighbors we can all count on. Bless all the nice neighbors! Now I have three punnets of different kinds of tomatoes and I dedicated some datterini tomatoes for this pasta. 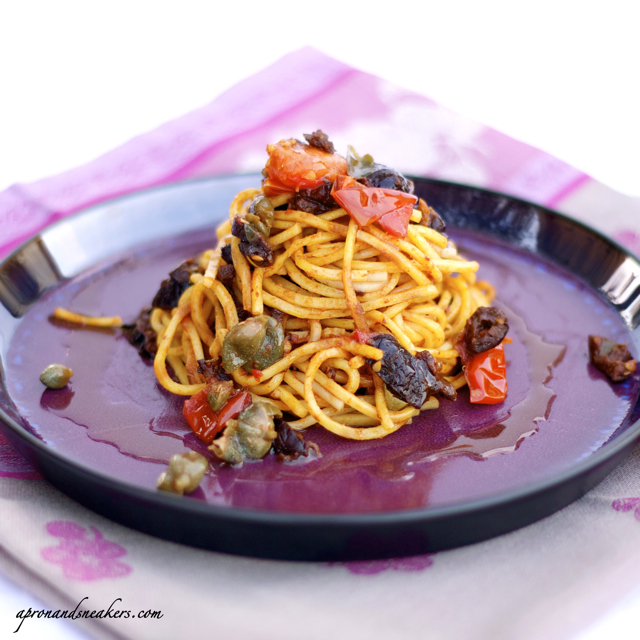 Backed up by the best of the Mediterranean flavors of black olives, capers, anchovies and extra virgin olive oil, here is a pasta that you can do over and over again. Purely delicious! Buon fine settimana! Have a good weekend! 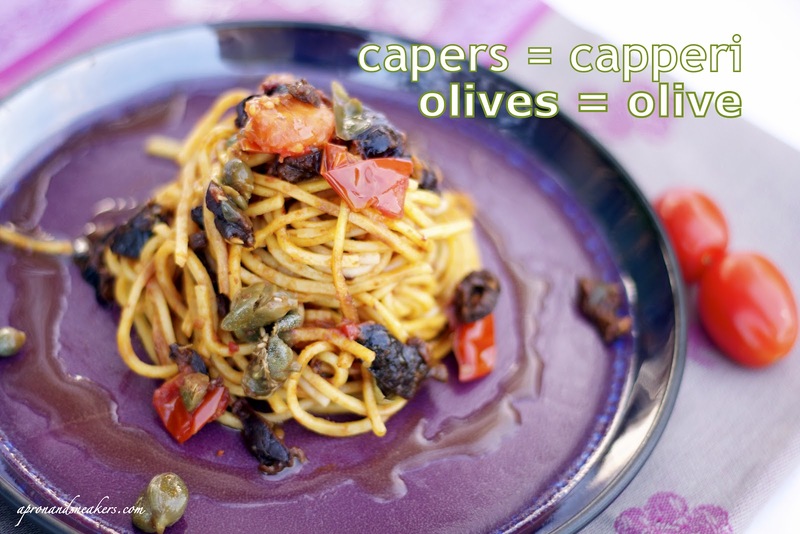 Soak the capers in water for a few minutes then drain them. Crush them lightly with the back of a fork then set aside. Over medium - high heat, bring a pot of water to a boil for the pasta. Meantime, over medium heat, in a saucepan with extra virgin olive oil, sautè the garlic until golden then discard it. 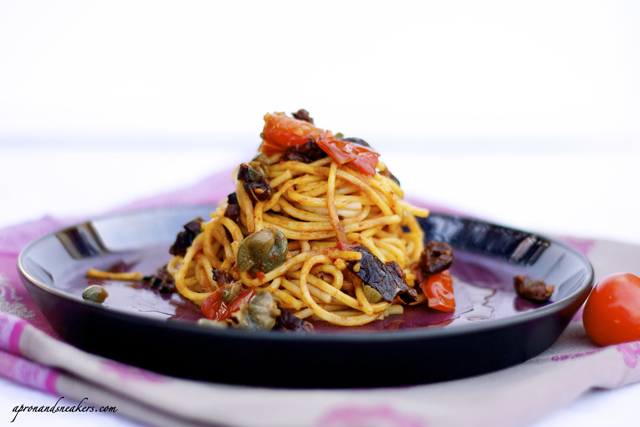 When the anchovies melt, add the tomatoes, olives and capers. Cook for about 10 minutes. If the sauce dries out, ladle some hot water from the pot you are boiling. Season with pepper and add some salt if needed. Turn off the fire and cover to keep it warm. When the water for the pasta boils, add some salt then add the pasta and cook following the number of minutes indicated in the package. Drain. Save a little bit of the water in case the pasta is too dry. Transfer the cooked pasta to the saucepan with the sauce and mix well.